When you reach the age of forty, it becomes difficult to keep track of your body. The thing is that your body may respond differently to diet and trainings. However, your desire and hard work can do wonders. Just follow your dreams to achieve the perfect body! The belly is one of the problem areas for women after 40. Keeping your belly beautiful after 40 is not just tougher, it can also be painful if you have health problems that prevent you from doing all the moves you need to do for a flatter tummy. That is why, we have designed Pilates moves that can help you achieve a firmer and flatter belly. These 4 moves will stretch out your neck and spine while building your core. 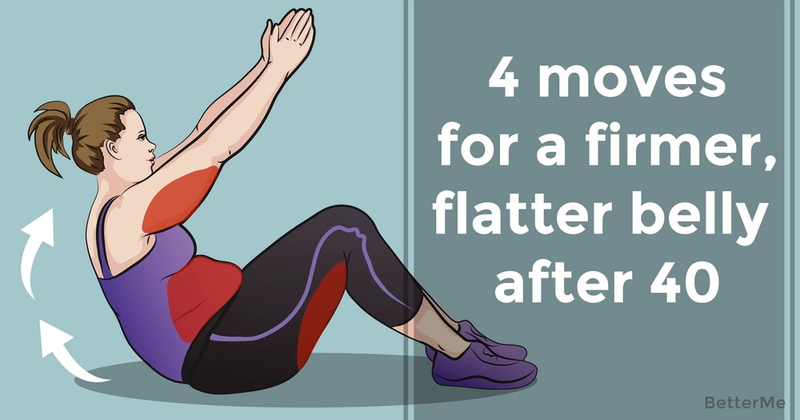 To perform these exercises, you don’t need to lift your head, neck or shoulders. Our Pilates workout includes exercises like Roll Down, Inverted V-Plank, Plank and Single Leg Lifts. However, if you want to achieve perfect results, do not forget to combine this workout with a proper diet. Try to combine foods that contain protein, carbs, and healthy fats. Drink enough water to keep your body hydrated. You should perform these exercises 3 to 5 times a week, for 6 weeks. Work hard and you will get what you deserve! Well, scroll down to see how perform these moves!